It's that time of year again! It's time to cleanse your souls, that's right! It's time for the annual purge! The New Founding Fathers of America decreed that every year on March 21st, all crime is legal, including murder, for a period of 12 hours. It is believed that this annual release purifies you of your desire to break the law and do wrong. The NFFA claims that you can't argue with results as unemployment is minimal, crime is down, and poverty is staggeringly low. Except this year, an anti-purge group led by Carmelo (Michael K. Williams) is rising up, as they believe the purge is a form a population control and an excuse to murder the poor. All the while, a couple named Shane (Zach Gilford) and Liz (Kiele Sanchez) have a car that breaks down on a bridge right before the start of the purge and are forced to run for their lives on the streets. A woman named Tanya (Justina Machado) and her daughter Cali (Zoe Soul) are forced out of their apartment by gunned and armored home invaders. And finally, a man known only as Sergeant (Frank Grillo), who is out looking for revenge, decides to help these people who have gotten caught in the middle of the chaos of the purge. Their only goal is to simply survive the night with their lives. Now that I got that out of my system, we are here to tell you that this is a pretty great sequel. Is it just us, or are sequels sort of hitting it out of the park this year?! It takes the concept of the first purge movie and turns it up to 11. We think that taking the focus away from a family who got wealthy off of the purge (Ethan Hawke's character in the first film sold purge security systems) and putting it onto a more relateable, lower income group of people who didn't necessarily want to be involved in the first place was a brilliant move. It also takes the home invasion aspect of the first movie out of the film entirely, putting the main characters directly onto the streets of the city as the purge is going on around them. The chaos, thrills, and horror are allowed to progress more naturally in the middle of the purge as the sense of danger is greater because you never know who is friend or foe. Anyone who tells you this second installment isn't political is kidding themselves. The entire series is very political. It's basically government sanctioned class warfare taken to an extreme. 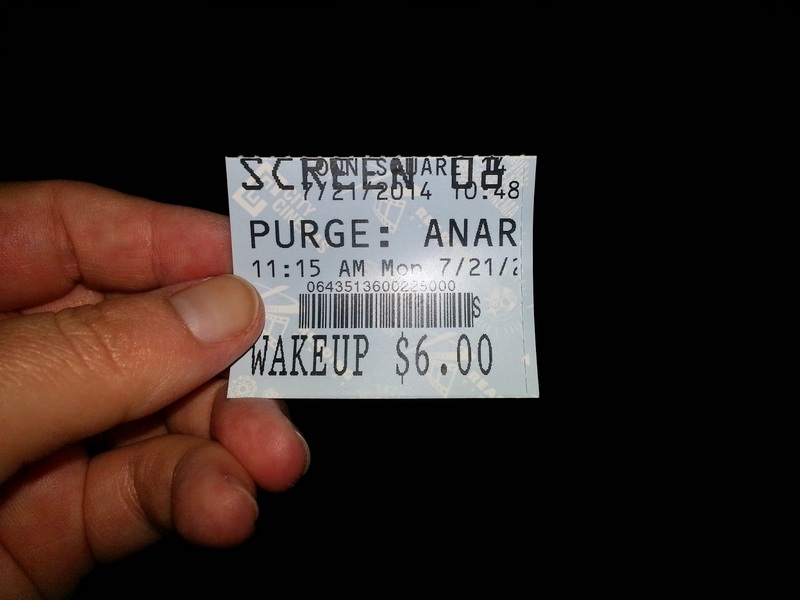 The scary part of this film is less about the horror and murder and more about the idea of indoctrinating our nation into thinking that the purge is a good and necessary thing to do every year. Everything down to the creepy almost religious-like chanting before a crime is committed reeks of tyrannical dictator's past. Some might think that this is a totally unrealistic scenario, but our history begs to differ (see: the Spanish inquisition, the Holocaust, Rwanda, Cambodia...the list goes on and on and on). It's mind-blowing and horrific to think of what a society is capable of if they are given the green light and encouragement to do so under the notion that it is their government sanctioned right. The characters as a whole are less important next to the overall theme of the movie itself. On top of all this, we are adding another element into the mix with Carmelo's group of anti-purge radicals, who espouse their rhetoric constantly and vigorously. The only thing about Carmelo's character is that it seems like he was simply inserted into this movie in order to give him slight character development for a bigger role in a third film. We would have liked to have seen a bit more development in this installment as it felt like he was just yelling at us every time he was on screen with no clear reason as to how and why he got to that point in the first place. 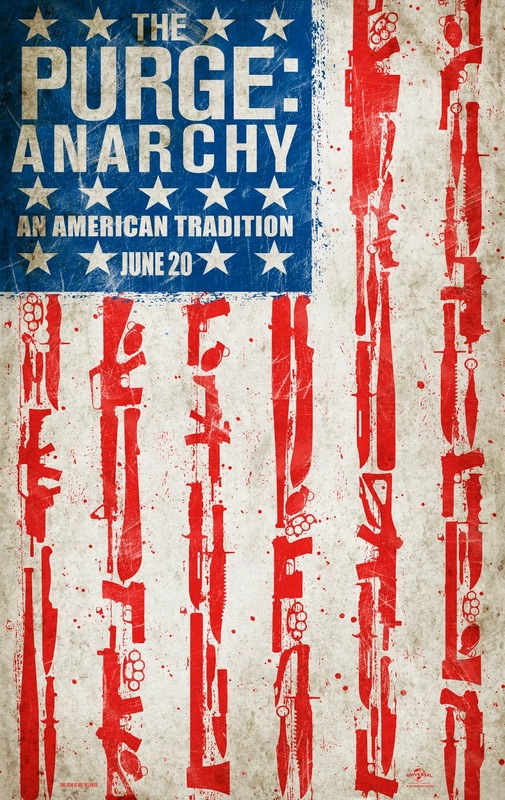 What we really like about "The Purge: Anarchy" is that it has a raw B-movie exploitation feel with a strong budget to back up its ideals. It has all of the violence and gore you would expect from an exploitation film, but with the clean, Hollywood-ified look. All in all, it's bigger, bloodier, and much better than its predecessor. We cannot wait to see if a third film will get made. One year ago, we were watching: "Pacific Rim"